Project manged the delivery of a £500,000 community hydro-electric scheme. Feasibility study and design work for a £2m Eco-house using PV, Wind, Hydro, heat pump and energy storage. Case Study. 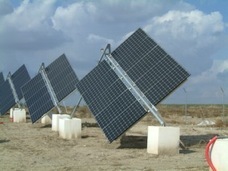 Design of several 50kWp and 100kWp ground based PV arrays. Feasibility study and wind resource analysis for a 1MW wind turbine at a Premier League football stadium in conjunction with E.on. Several grid connection feasibility studies for 1-5MW PV projects. Review of more than 20 alternative land rental offerings from PV project developers on behalf of a large land owner with more than 20,000 acres. Working with the south west’s largest brewer to investigate the financial and technical feasibility for a £1m hydro scheme. Provide feasibility study and general advice to several prime contractors install wind turbines in new schools as part of the Building Schools for the Future programme. Produced and delivered a series of renewable energy training courses to SMEs in partnership with Business Link. £160k project part funded by RDPE to investigate the renewable energy options for 10 rural businesses. Feasibility study and design of 20kW roof mounted system for an office block retrofit. Various PV systems design, planning, grid connection and consultancy services ranging from 200kW to 5MW roof and ground mounted systems for land owners and developers. Management of several projects as part of a carbon reduction programme for a £100M brewery. Advising client on the implications of the CRC Energy efficiency scheme. Detailed study and recommendations to a brewery building a new 33 bedroom hotel. Case Study. Detailed study into the renewable energy options for a 250 pupil primary school helping them work towards Eco-schools Green Flag status. Case Study. Review of documentation and procedures for a small wind turbine manufacturer to help them become an accredited installer under the MCS scheme. Design and project management of a €900,000, 120kWp PV plant in southern Spain. Working with a Spanish subcontractor and equipment suppliers from Holland, Italy and the Czech Republic. Used software simulation tools including PVSYST. Case Study.